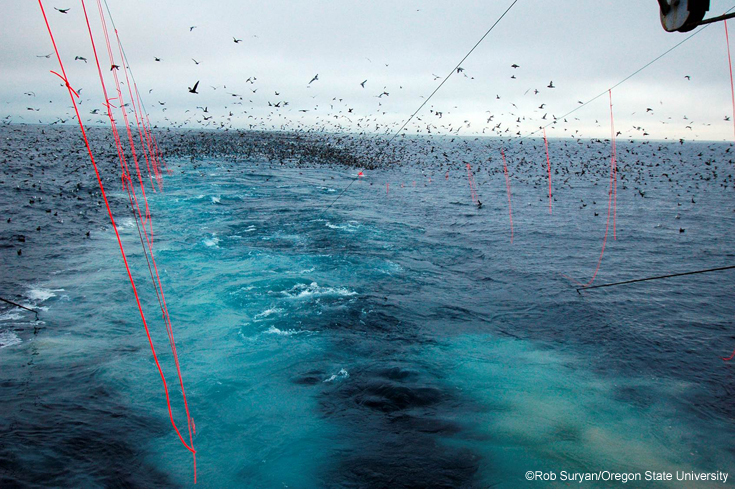 The National Marine Fisheries Service (NMFS) has some exciting news for seabirds: Streamer lines are now required in the Pacific Coast Groundfish Fishery! Break out the squid and champagne! Ok, just kidding on the champagne, but as a species that often mates for life, the short-tailed albatross knows something about romance. This final rule means that fishing vessels 55 feet or longer now require streamer lines to deter seabirds from becoming hooked or caught in fishing line, and that the endangered short-tailed albatross—along with other West Coast bird species—is now better protected. The rule was recommended by the Pacific Fishery Management Council in 2013 due to the impact the Pacific groundfish fishery has on the albatross, whose population size is an estimated 600 nesting pairs, significantly down from historical numbers in the millions. The survival of this species is threatened by multiple stressors, including changes in food concentration and location, contact with fishing vessels and plastic debris. A paper released in 2013 showed high levels of interaction between the Pacific Coast Groundfish Fishery and the albatross; the albatross, unable to see hooks or fishing line, can accidentally ingest the hooks or become entangled in fishing line. Streamer lines, used widely in Alaska with high rates of success, were naturally part of the solution. They are relatively low cost and easy for fisherman to use, and were shown to significantly help keep albatross away. In fact, they are already being used voluntarily by some fisherman in the fleet. Here’s how they work: Bright orange tubing is vertically suspended from a line above the water. The birds are startled by the color and movement, and the baited hooks are safe as they go into the water. This keeps the birds from getting entangled in the fishing line or encountering a hook. Bait is preserved and fishing line remains untangled, making life easier for fisherman and bird alike. NMFS’s action finalizes a good example of how science, good management, and fishermen initiative can allow low-tech, inexpensive equipment to put a major dent in a real problem. Seabirds face many uncertainties as their environment changes, but this final rule gives them a better chance for survival, and hopefully many more years of winged romance. For more about the short-tailed albatross’ amazing recovery, please see an inspiring story by our colleagues at Audubon.